To make the paratha dough, Take wheat flour in mixing bowl. Add cumin powder, carom seeds and salt to taste. Knead the dough well. Consistency of dough should be soft like regular chapati/roti dough. Apply few drops of oil on dough and cover it. Let the dough rest for 20-30 minutes. First peel and grate radish. Squeeze out water form it. Heat 1 tbsp oil and add green chilies, chopped onion to it. Saute till onion becomes slight brown in color. Add grated radish and saute till all moisture evaporates. Add coriander powder, turmeric powder, sugar, chopped cilantro and salt to taste. Saute for 2 minutes and switch off the heat. Let the mixture cool down. Make 4 equal sized balls of stuffing. Take a big sized ball of dough and roll it like a small puri. Roll the edges, keeping middle part thick. Place medium sized ball of radish stuffing onto it. Cover all sides of stuffing with edges of dough. Dip into flour and roll gently and evenly from all the sides. Keep paratha little thick than chapati/roti. Nice Paratha perfectly done !! Nice to c ur space...Happy Shankrathi.. 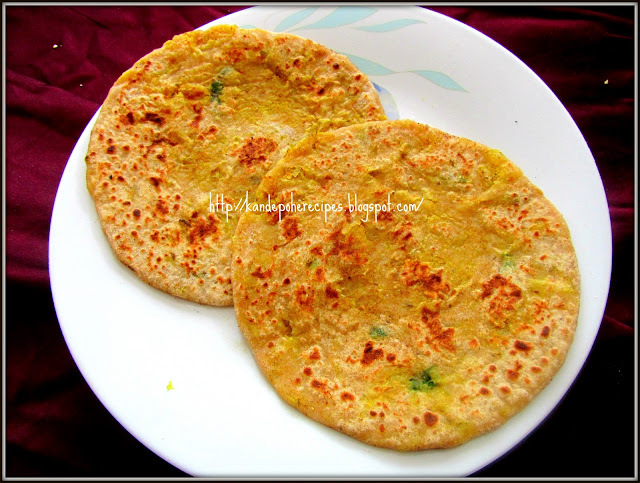 Perfectly yumm luking Parota Dear.Delish click 2.